This is the first time I've joined a sketch challenge, and I've had a lot of fun giving it a try! My card is based on Makeesha's sketch here. My card ended up with a bit of a country feel. 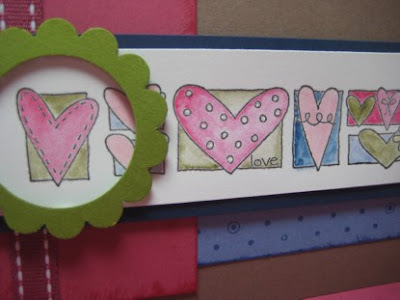 Using the A Little Bit of Happiness hostess set, I stamped and embossed the image, then coloured it with the Watercolour Wonder Crayons, in the Rich Regal colours. Then I matched the image with cardstock in Close to Cocoa, Rose Red, Night of Navy, Brocade Blue and Old Olive, most of them distressed on the edges with their matching ink colours. I stamped the polkadots from the Polka Dots & Paisley set on the Brocade Blue piece. But my favourite part was making the cute scallop frame. First I punched a 1 1/4" circle on a piece of Old Olive card, then punched the Scallop Circle punch over that, centering it over the circle I had already punched. I adhered it with scraps of dimensionals. In the top right corner it was looking a little empty, so I sprinkled some hearts from the Sprinkles set! 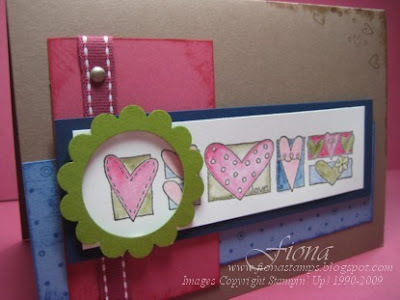 I love the way you've used the punch out as a frame for the stamped image! If this is your first - wow! You go girl, the rest of us will have to pull our our socks!! I haven't been doing them long either but I am really enjoying the challenge. Just LOVE this Fiona. Especially love that frame - just GORGEOUS! Love it - the spotlight over the heart is a great idea and a nice take on Keesh's sketch! This is very clever. I love that scallop frame. Well done. 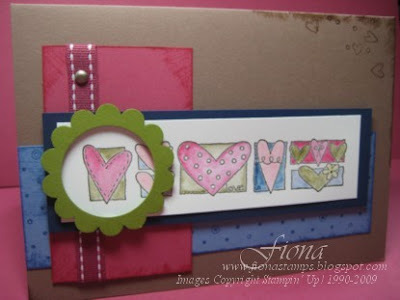 Great use of the stamp and the punches - love your take on this sketch!